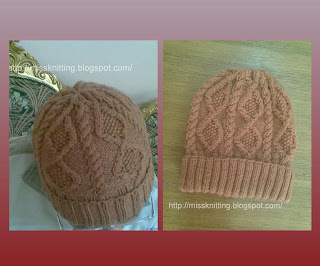 I have made this hat for my great fan-LOL it is my brother -Ahmed. He loves my knitted work, he also was the first one who wore my initial work. They were very small things. Hats with simple stitch and no shape, scarves with very simple stitch and bad finishing. He wore them with love and appreciation too. He also wore them , and feel they are worth. That is why I want to make him really worth pieces. I think I will. its a real fantastic hat and I am sure your brother loves it.. I love the hat! The pattern is so intricate. It must have taken a lot of concentration to knit this complicated pattern. And I really like how it looks like 'ropes' going up to the top and then all of the tiny work inside the diamonds is amazing. Its so pretty. I also love that you have shown some in-progress pictures of what it looks like at different stages and different angles. The color is also nice for a man.